Readers of Penthouse magazine were treated to a special "Science and the Future" issue in October of 1978, which acted as a sort of coming out party for OMNI magazine. OMNI, "a magazine of science, science fiction and the future," was launched in October, 1978 by Kathy Keeton, the future wife of Penthouse publisher Bob Guccione. The issue included an article on robot rights, fiction by Anthony Burgess about the decline of the British Empire in 1985, hilarious 70's fashion photography of the future, a look at six different car designs of the year 2001, and a nine page preview of what makes OMNI the "first magazine of the 21st century." SPACE: the final, full-frontal frontier... the last hurrah... to go where no man has ever gone before, the forbidden and yet insidiously alluring planet of NYMPHON in the second quadrant of PHI DELTA PUBIS, hard by the tumescent moons of GLUTEON MAXIMUS. It was here that I said good-bye to an intrepid friend, a great lady, whose heaving decks and smoldering afterburners had served me well -- the Yenta Prize, peripatetic mistress of the cosmic seas. I beamed down... down into the swirling, choking vapors that envelop NYMPHON, down to the very floor of this curious planet where, unused to the dense, jellylike atmosphere, I passed out. 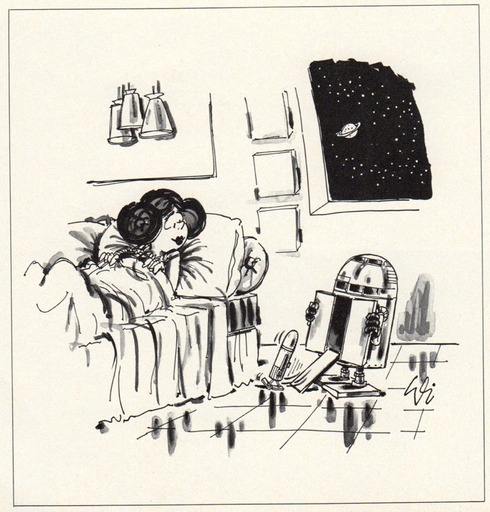 The Star Wars cartoon below certainly reminds me of this article from 1928 about robot lovers of the future.